The weather has taken a turn for the chilly here in sunny California, instead of a balmy 85-95ºF (30-35ºC), we’ve had a rather breezy 65-75ºF (18-24ºC). I can hear the groans already. No, I haven’t already become accustomed to warm, pleasant weather in which showing your toes and your knees is acceptable. No, I haven’t forgotten that for 50 weeks of the year in England you have to leave the house with an umbrella, winter coat and wellies. I am simply stating that the tropical weather we experienced for the past week or so has shifted to a much more spring-like mix of breezy and cloudy. This means that a different type of spring cuisine comes onto the menu, the spring soup! This Martha Stewart recipe, called Shrimp Stew in the magazine, is very simple using flavors that we all know and love: fennel, leeks, shrimp, cream. 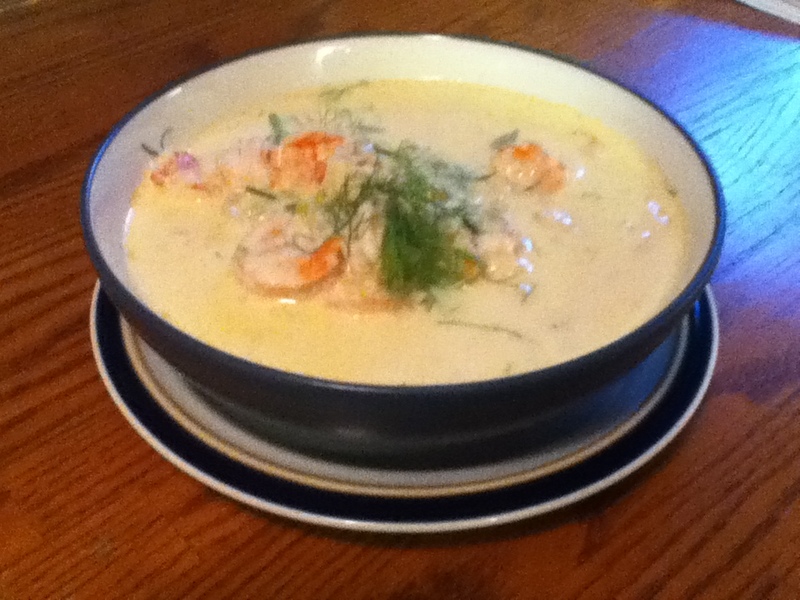 After a verbal tussle with my grandmother in the grocery store − goodness knows what the guy behind the counter thought of us − I convinced her that it was a necessary evil to get the shell-on shrimp so I could, personally, de-shell them and use the shells to make the broth for the soup. 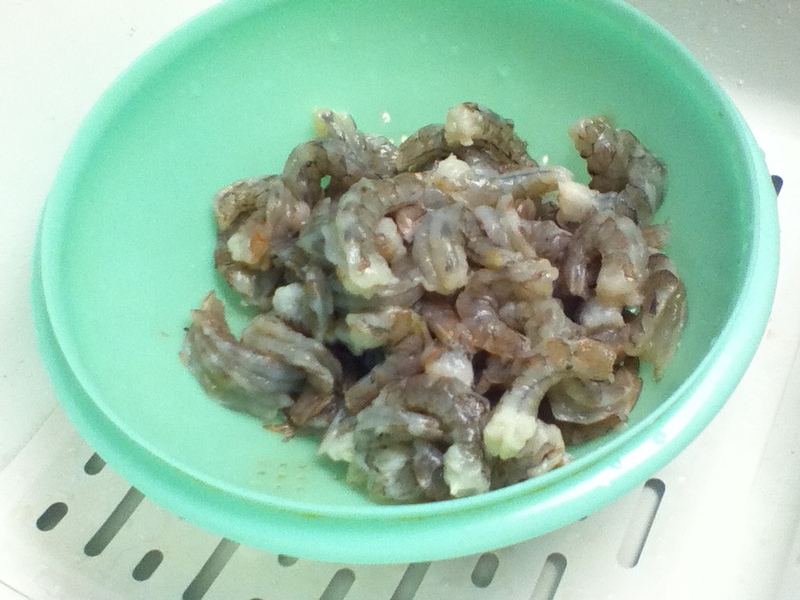 After an hour of shelling prawns, I was almost ready to admit that maybe it was more work than I had envisioned, maybe it would have just been easier to buy some ready-made fish stock and I suppose both of those are true. However! I think the shells really did give us a great broth, even after just 15 minutes of simmering the broth took on this great deep color (although I’ve just realized you can’t see that in the picture, below) and the flavor of the soup in the end was really quite good. P.S. I chucked the stalks from the fennel in with the shells too because that would’ve otherwise just gone in the garbage and, if you ask me, it gave it that little extra something. Take that, Martha. After that initial slog of shelling the prawns, the rest of the soup is pretty quick and simple and it’s perfect for a slightly cooler spring evening where you don’t mind having something hot on your plate, or in your bowl. It’s also not actually that much work. The simmering time of the broth gives you a chance to tidy up the kitchen and then, once you’ve strained it and wiped the pan out to cook the vegetables, you’ve got another 15 minutes to do any remaining dishes and get ready for serving. Plus, you can make it ahead and just add the prawns when you heat it through − they literally cooked in about 30 seconds − which makes this soup/stew perfect for entertaining. The flavors are, as you would imagine, very delicate and fresh, despite the cream. A sprinkling of fennel fronds tops it all off and the recipe, which claims to serve six, made about four large portions. I guess it would serve six as a starter, but as a main course, too, it was filling, impressive and really delicious. 1. Heat oil in a large pot over medium heat. 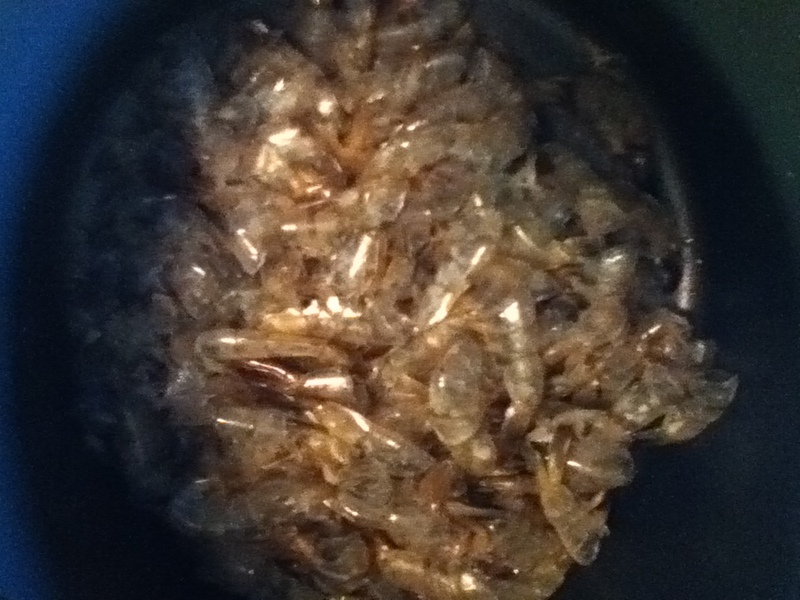 Add shrimp shells and cook, stirring occasionally until browned, about 10 minutes. Add thyme and cook for another minute or two. 2. Add wine, scraping up any brown bits on the bottom of the pan. 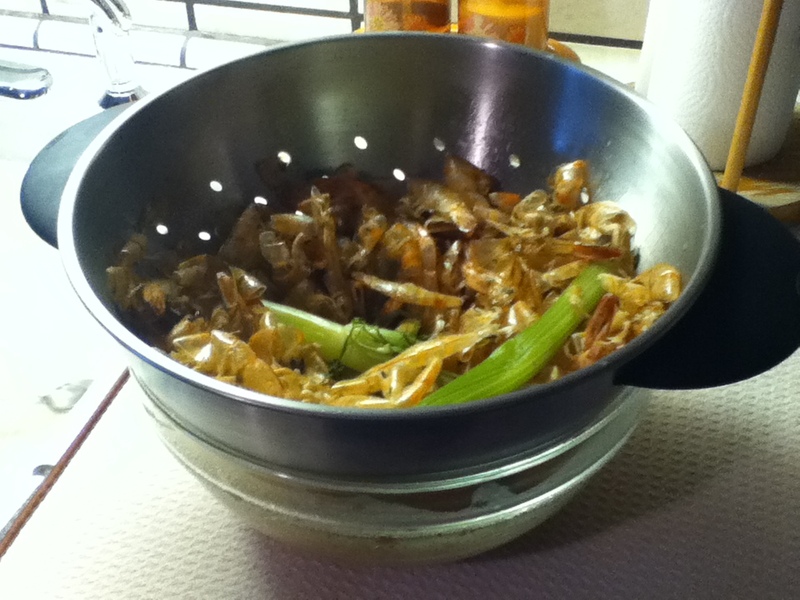 Then add clam juice and water and simmer together for about 15 minutes. 3. Strain broth into bowl, pressing on solids. Discard solids. 4. Wipe out any stray shells and melt butter in pan back on heat. Add leeks, fennel and fennel seeds, 1/2tsp salt and cook, stirring frequently, until vegetables are soft and just start to brown, about 10 minutes. Add broth and cream and warm through. 5. Stir in shrimp and cook until just done, a minute or two. Adjust seasoning and squeeze over lemon juice. Serve in shallow bowls and garnish with fennel fronds or dill. I want to try some fennel pollen. Wouldn’t that be a lovely touch sprinkled on top? Looks delicious. Fennel pollen would be good, and so California. Definitely. We will have to try to get our hands on some of that! Love fennel and this soup looks yummy! It was, it was! And so simple once you get the shrimp sorted out.